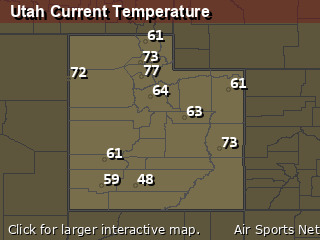 Change location by the zip code or city,state: or search for other weather forecast locations in Utah by name. This Afternoon... Mostly sunny, with a high near 56. 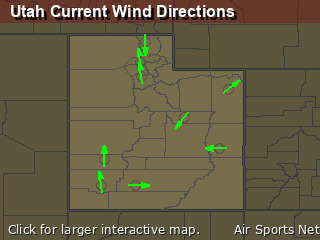 West northwest wind around 8 mph. Tonight... Mostly clear, with a low around 37. Northwest wind around 6 mph becoming calm in the evening. Wednesday... Mostly sunny, with a high near 61. Light and variable wind becoming west around 5 mph in the afternoon. Wednesday Night... Partly cloudy, with a low around 39. Light and variable wind. Thursday... Mostly sunny, with a high near 64. South southeast wind 5 to 7 mph becoming west southwest in the afternoon. Thursday Night... A 30 percent chance of showers and thunderstorms. Mostly cloudy, with a low around 43. Friday... A chance of showers, with thunderstorms also possible after noon. Mostly cloudy, with a high near 65. Chance of precipitation is 40%. Friday Night... A chance of showers, mainly before midnight. Mostly cloudy, with a low around 41. Saturday... A chance of showers. Partly sunny, with a high near 63. Saturday Night... A slight chance of showers. Partly cloudy, with a low around 41. Sunday... A chance of showers and thunderstorms. Partly sunny, with a high near 61. Sunday Night... A chance of showers. Mostly cloudy, with a low around 37. Monday... A chance of showers. Partly sunny, with a high near 56.